PRWeek Asia analyzes the 2015 Marketers' Outlook Survey, conducted by Campaign Asia-Pacific in conjunction with Ipsos, through a PR practitioner's lens. 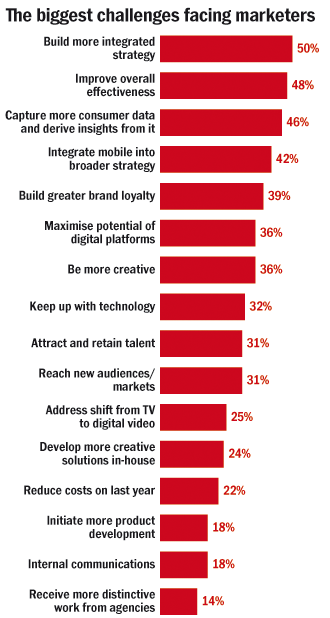 What marketers are worried about, what they want from PR agencies and what they will be willing to spend money on. The IMF put out a nice color-coded chart in its October 2014 economic outlook that shows the bulk of Asia as a solid leader for worldwide growth. The Conference Board, an independent business research association that has voting members from firms like Johnson & Johnson and Deutsche Bank, echoed that sentiment with a simple sentence on its 2015 business outlook: "The Asia-Pacific region remains the leader for global growth". And while growth is good, no one is calling for a boom. Every region faces challenges, which Businessweek already nicely catalogued in November. Still, with Asia looking like the bright spot in a relatively pale forecast, how companies plan to go to market here takes on heightened importance. Clara Shek, managing director of Ogilvy PR, says her firm’s global clients consistently remark that "all eyes are on Asia to provide growth". At the same time she reports CFOs she speaks with are more concerned with profitability in 2015, saying it’s "a year where people need to pay close attention to cost management." Clients, she says, might "expect us to do more with less. You don’t necessarily need to do more—but you need to do it smarter." 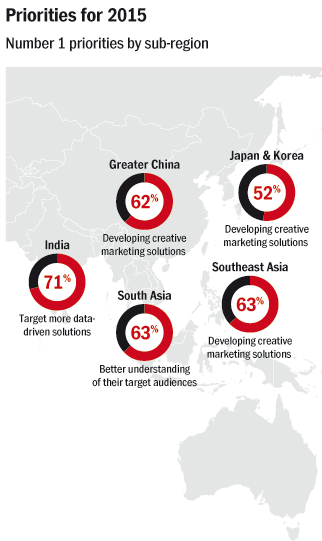 Results from the Marketers' Outlook Survey (in which Campaign Asia-Pacific and PRWeek Asia worked with Ipsos to poll marketers in China, Hong Kong, India, Japan, Indonesia, Japan, Malaysia, the Philippines, Thailand and Vietnam) also highlights a need for PR agencies to get smarter about demonstrating creative and strategic abilities. According to figures from eMarketer, advertisers are likely to spend US$592 billion globally in 2015, which is 6 percent more than in 2014. While the US still leads by a large margin, pegged to spend $189 billion on ads, eMarketer says spending in China could pass $73 billion and Japan (still with a challenged economy) should lay out over $40 billion. Almost all of Asia shows some level of growth in the forecast, even Japan, but in most countries the increases are only a minor percentage, so agencies really are likely to face a do-more-with-less conundrum in 2015 as expectations for the region climb but budgets barely budge. Or even shrink. Granted, the forecast numbers quoted above are for advertising spend. Nonetheless they provide a good background on what’s at stake. And with the line between what’s an ad and what is PR continually blurring through the ‘marketing’ lens, the money will wend its way through a multitude of agency types. For PR agencies, the big takeaway from the Marketers’ Outlook Survey is a big bump in demand for creativity. Regional decision-makers at brands seem to have put both creativity and strategy high on the priority list as far as what they want from all of their agency partners—including PR agencies. At close to a two-to-one ratio, marketers specifically said they wanted to see more strategic and creative thinking from PR agencies, versus satisfaction with performance on the same metric from the previous year. The ratio was about the same in 2014’s outlook, indicating that brand leaders may feel that there is a perennial gap between what they expect from agencies versus what comes out of the PR pipeline. That is not to say PR agencies are failing, but it certainly signals that they have further to go to reach full potential. "What will never change among our clients is demand for creative thought leadership," said Damien Ryan, head of Hong Kong based Ryan Communication, giving some perspective on the findings. "Our clients are largely B2B and include financial and global corporates. They seek to engage and influence stakeholders through substance." Substance does seem to be what brands are increasingly looking for. And compared to peers in creative, digital and media agencies, PR firms did post a smaller gap between what marketers thought agencies did well in 2014 compared to what they said are top concerns for 2015. Survey respondents also want to see more leadership on the processes around creative and strategic efforts from their PR partners in 2015. That finding might give agencies pause, but it also reveals an area to work on, both as a matter of internal structure and external marketing of capabilities. Yet meeting client demands can be a bit of a moving target. While a majority of marketers stressed the importance of creative and strategic thinking at all their partner agencies, when it comes time to choose a new partner, the top attribute marketers said they look for in a PR firm is versatility in handling different media types. It seems while creativity and strategy are what brand leaders say they want most, it’s not actually the characteristic that will make or break a relationship. A separate question showed that capable execution is the real bottom line when it comes to picking and keeping a PR firm. Even if marketers want to see more creativity, there may be enough of it in an existing relationship to keep them from switching agencies. So is there some disconnect between what marketers say and do? On that front Ryan says that "for a start, you have to have the basics right, which for us, means stable account teams, a dynamic workplace with creative and supportive colleagues. Then, there’s subject matter. Our clients are complex and you have to understand their businesses to add any value. Executing great ideas through multiple channels is actually becoming easier. What our clients want is a deep knowledge of their business, peers, industry and products." Stephen Thomas, group head of corporate communications at AIA, says what he looks for from an agency "is providing a fresh perspective, creative thinking and strategic counsel". The Outlook Survey also drills down to some specific areas of focus for marketers in different parts of Asia. The good news for PR agencies here is that developing creative marketing solutions came in at the top in nearly every region. That should be interpreted as opportunity for firms that have already embraced the blurrier media world where content and marketing come together on digital platforms. From PRWeek’s interview with Weber Shandwick’s global CEO Andy Polansky, it’s clear "PR companies have an opportunity to thrive in this environment." The amped up demand for creativity and strategy means brands are far more likely to take a page from Deng Xiaoping theory in regards to which kind of agency should lead: "It doesn't matter if a cat is black or white so long as it catches mice." Research published in Campaign throughout the past year has repeatedly shown how smartphones and tablets have started to dominate consumer time, taking it mainly away from long-trusted TV. And that trend bears out in the outlook results. More than twice as many marketers said they planed to reduce or not use TV than said they would expand it’s use in 2015. On top of that 61 percent said they would start to use or expand use of social-media marketing. 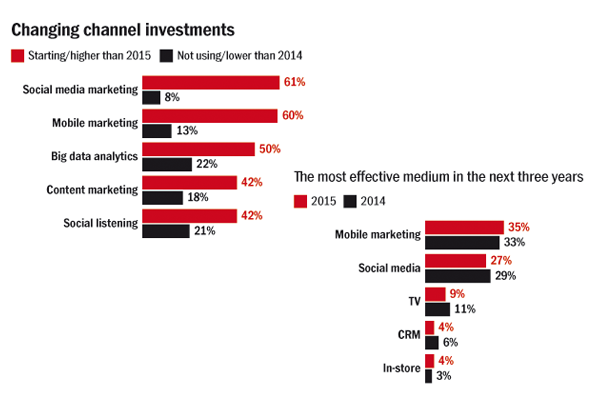 Traditional paid media channels largely fell to lower priorities in marketers’ plans. While TV still gets a lot of lip service in conversations with brand decision-makers and creative agency leaders, the outlook survey shows the medium as one of the largest percentages of no change or reduced spending in 2015. While 38 percent of respondents said they would keep TV budgets about the same, 43 percent pegged TV for cuts. That is one of the biggest drops the survey recorded for this year. Print, radio and outdoor all saw spend shrink in marketers’ plans as well, but none to the extent of TV. And none saw as big of a drop when compared to the previous year’s survey. Amanda Mohar, Weber Shandwick’s digital director for Asia Pacific, says that based on the survey results it finally looks like budgets are shifting to reflect user trends. "People are trading TV time for time spent online, and even those who do sit down in front of a television are probably only giving it part of their attention," she says. "We’re seeing ‘second screening’ among the majority of internet users in nearly every Asian market – much more so than in markets like the US and the UK." "These trends in spending also reinforce the importance of investing in smart, strategic integrated programs tailored to the audience. Media consumption among consumers remains higher than ever, but the way it’s delivered continues to diversify." Through the course of 2014 a lot of talk came from the digital side of the agency world about mounting data and research that pointed to more people living on digital platforms rather than in a broadcast world. The question from these proponents has long been "why then are brands still asking for 30-second TV spots?" So it appears, in terms of Asia’s marketing spend, the tide may have finally turned in digital’s favour. With the marketing sway of traditional paid media slipping, brands are more likely to pay greater attention to the owned and earned variety; and therein is opportunity for PR firms. The softer art of influence (versus the hard sell of advertising) has always been the main purview of PR practitioners and that strategy fits perfectly in a world where branded content, or brand journalism, or native-advertising type storytelling has picked up steam. Tetsuya Honda, the managing director and CEO for BlueCurrent Japan, says there’s a struggle all brands are going though at the moment. Taken as a whole, social, mobile and digital technologies have flipped around the traditional dynamic of how media works, taking control away from companies and putting it into the hands of consumers. So the question for brands, Honda stresses, is "how do you control the uncontrollable?" A decade ago, marketing, media, PR and the intersection of all of them was, relatively, much more under a corporate thumb. Digital technology has flipped everything around. The whole industry is grappling with this problem. People set the rules for where and when they consume media—nobody can dictate that to them anymore. And it goes beyond consumption; consumers are also producers, with palpable influence. Navigating that condition is challenging for brands. The survey results suggesting companies want more guidance and direction from agencies didn’t surprise Honda. "Getting people involved or engaged, that’s our [PR’s] expertise," he said. 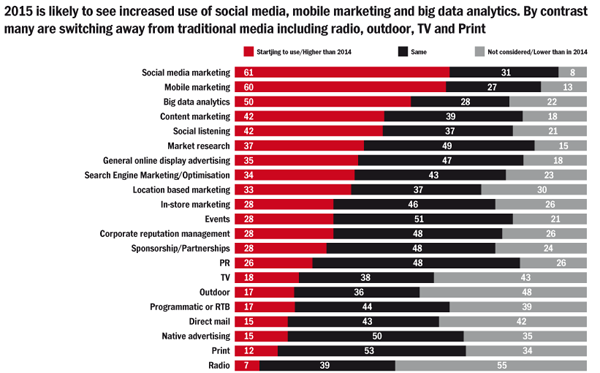 And survey data does confirm marketers want to expand social-media use. A large majority, in fact the largest block in the survey overall, said they intend to start or increase use of social media. Looked at another way, social media also had the lowest percent of respondents that planned to reduce or had no plans for use. 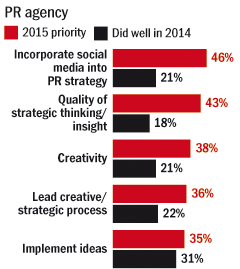 But the survey also reveals a major challenge for PR firms. Though social media came out as a big winner budget-wise, PR agencies were not the first place brands thought to look when they wanted help with social media (though on a year-over-year basis that seems to be improving). Oscar Zhao, CEO of BlueFocus Communication Group in China, addresses the problem as partly rooted in PR’s own heritage. "In the marketing and communication sector," he says, "wisdom and experience are always our core competencies, with creativity, strategy and content being the best ways to reflect our professionalism. When it comes to technology, however, the industry is found wanting. Technology has never been valued." He also laments that often talented people with "technology backgrounds are rarely seen among elite players and global industrial leaders." So he says his aim is "to find a brand new way of changing history; we are transforming our creativity-based business into a company with the technology gene". 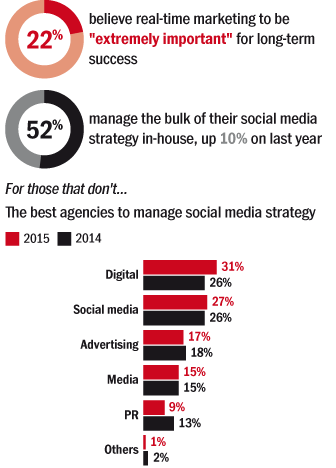 Still, for 2015 a larger percentage of marketers said they would chose every other type of agency over PR to head up their social strategy. Clearly, PR firms need to do more to educate potential clients about what they do well. Social media should be an area PR dominates because the mix of social and media is what the practice is all about. Part of the disconnect could be rooted in how marketers think about all the various places to allocate budget. Divvying up funds to spend on TV, social or other avenues distracts from what Honda says is the more important piece of the puzzle, the content. "Clients can think too much about the ‘how’ [of communication]", he says, when the real focus needs to be on ‘what’ is the message. That’s a sentiment many PR agency leads agree with. "While platforms and communication channels are evolving, which is fragmenting audiences, strong content remains at the heart of any tactic," Ryan told PRWeek. "The biggest risk for communicators and marketers today is they place too much emphasis on the channel, such as mobile communication or Twitter, at the neglect of content." Message first, how to deliver it second—but that’s not how budgets work. You can’t allocate spend for ‘what’ you want to say. From a finance and forecasting point of view, you can only look at the ‘how’ and how much saying it will cost you on different channels. There is a structural issue there that will take a very high-level shift in thinking to address, so this disconnect is likely to persist. And it may be the force behind why the Marketers’ Outlook Survey also revealed that about 50 percent of respondents opt to bring the corporate social-media practice in house. "There is often a definite need for external support," said AIA’s Thomas, "but given the nature of social to allow companies to interact with stakeholders in a timely, targeted and genuine manner, it makes sense to have the close involvement of in-house teams who best understand their company's authentic voice." Thomas’ outlook seems to be a more predominant view this year, as 2015’s survey shows a significant uptick of 10 percent from the previous year’s results, as far as brands looking to handle social media entirely in house. But in-house or otherwise, at the end of it all, what companies set aside to spend on marketing and communications is the true driver for the whole industry. And while overall sentiment in Asia appears to be healthy, with a slim majority of marketers expecting budget growth, in terms of traditional media spend, there is a shrinking trend. And that again underlines the rising importance of owned and earned channels. Two years ago, half of those polled said they expected an increase in media funds at their command. This year only 39 percent said the same. Which is a continued downward trend from 2014’s outlook, when 43 percent still anticipated an increase. 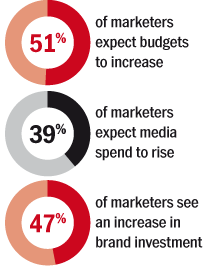 For the third year running, even as overall spending forecasts grow, a smaller portion of brand leaders believe they will see an increase in media budgets. Which brings us back to Shek’s comment in the opening about doing more with less. In 2015, with high demand for creativity and strategy, the agencies (of any kind) that focus on working smarter will be the ones getting more business. The marketers' Outlook Survey is an annual study from Campaign Asia-Pacific, conducted in conjunction with Ipsos. You can read more results from the survey in February’s issue of the magazine.